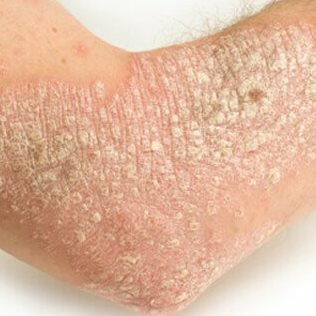 Psoriasis is a common, non-contagious skin disorder in which skin cells regenerate, mature and move up through the layers of skin about 5 times faster than normal skin cells. The top layer of skin is unable to shed these cells properly causing them to build up and form thick, dry patches. Inflammation under the scale then builds causing redness, itch, and pain. Psoriasis affects 7.5 million people in the U.S.
Psoriasis can affect any part of your body. What makes these cells go a little haywire? Doctors believe its a combination of genetics and environmental triggers that create havoc with the immune system. First, the immune system releases a type of white blood cell called a “T cell” which attacks the skin then, with additional wires crossed, it promotes inflammation and new cell generation to contain and counter the attack. For some people, psoriasis is just a nuisance which can be relieved with creams, natural treatments and avoidance of triggers. For others, its disabling, especially when associated with arthritis. There is no cure, only management of the symptoms and many of the prescription medicines used to treat severe psoriasis come with a horrendous set of side effects including upper respiratory infections, headaches, rash, nausea, burning while urinating, muscle aches and more. We recommend trying other options before turning to prescriptions. Apply Emu Oil - Emu Oil has been shown to reduce the itch and pain of psoriasis; to soften the plaques and speed healing of skin. Apply other healing salves and natural home remedies try apple cider vinegar, banana peels or blends of oils like borage, burdock, calendula, marigold and chamomile all of which relieve the inflammation, pain, and itch of psoriasis. All of these can be mixed with emu oil to increase trans-dermal delivery. Our All Natural Psoriasis Cream has many of these ingredients or use Pure Emu Oil as a carrier and blend your own mixture. Build your immune system dietary supplements can help ease psoriasis symptoms from the inside. Multi-Omegas 3, 6 and 9, vitamin D, milk thistle, and evening primrose oil have been successful for some. Probiotics which help create a healthy digestive environment will also boost your immune system. Cleanse your system detoxifying herbal cleanses and diets will relieve your body of excess toxins which could be acting as triggers. Bitter Gourd Juice mixed with lime is a detoxifying juice blend which came up numerous times in my research with many testimonials concerning its help in reducing psoriasis. Moisture everywhere keep your home environment as moist as possible using humidifiers in dry weather. Keep your skin as moist as possible using healthy, hypoallergenic natural emollients. No dyes or perfumes choose products without dyes, perfumes and chemical additives that can irritate skin. Be aware of what you eat look for possible food triggers. Research and consider removing some of the most common allergens such as wheat, dairy, and sugar (alcohol) from your diet one at a time for a period of 6 weeks each to see if these foods are negatively affecting your health. Also increase your intake of foods with high fiber, folic acid (leafy green vegetables) and Omega 3 which have all been shown to improve skin conditions. Hard water only soft water is treated to only contain sodium, which isn't good for already dry skin. While hard water might leave more stains on your shower walls, it contains naturally-occurring minerals that some have found help their psoriasis. Water pumped in from your well or local treatment plant is usually hard. If you're using a water softener in your home, turning it off could benefit your skin. Lukewarm soak hot water is your skins enemy, but a lukewarm bath with Epsom salt, sea salts, goat milk, oatmeal or oils can soothe the itching and infiltrate scales and plaques. Moisturize immediately after your bath for double benefits. Apply other healing salves and natural home remedies – try apple cider vinegar, banana peels or blends of oils like borage, burdock, calendula, marigold and chamomile all of which relieve the inflammation, pain, and itch of psoriasis. All of these can be mixed with emu oil to increase transdermal delivery. Our All Natural Psoriasis Cream contains many of these ingredients or try pure emu oil alone or as a carrier and blend your own mixture.